I was delighted to meet many dogs in Southeast Asia that were not vicious or rabid. Before I went to Southeast Asia (starting with a flight from Manchester to Hanoi, Vietnam), I was advised by MASTA to have the rabies jabs. They don't immunize you against the virus but they still do a little to help. The jabs give you 48 hours after a bite to reach a hospital before fatal symptoms kick in. Without the jabs, you have just 24 hours. I had the rabies vaccine, but I still went on my travels feeling wary of dogs, cats, bats, monkeys and anything else that could carry rabies. I was made to believe that most mammals in Southeast Asia should be treated with extreme caution. I love dogs, but even I was ready and willing to avoid them at all costs. It turns out, that every single dog I encountered throughout Vietnam, Cambodia and Thailand was either extremely friendly or just too hot and tired to do anything. I think my entirely dog-free upbringing is one of the reasons I now find the animal so endearing. Sometimes I just smile at random dogs as they pass me by. What's more, the internet generation have turned dog-loving into a kind of cult, giving rise to words like 'doggo' and 'pupper' and a Twitter account called WeRateDogs with nearly 2.5 million followers. It took me a few weeks to relax around the dogs of Southeast Asia, but I did eventually. At first, I fawned over them from afar and let other travellers interact with them directly. 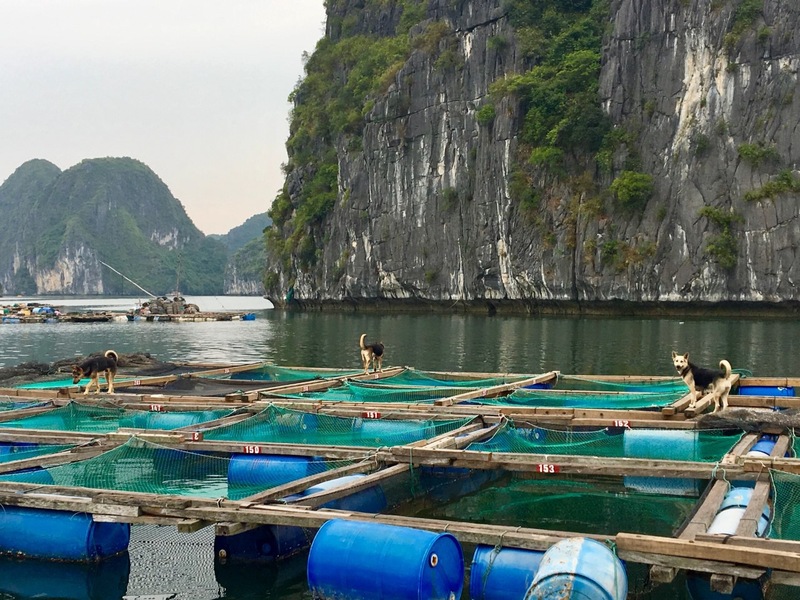 It was during this period of careful dog-distance that I encountered three brilliant dogs living on a floating fish farm in Lan Ha Bay. They were extremely friendly, scampering along the wooden walkways at such pace, but the wood was so narrow and rickety that we could only move slowly. It was impressive how nimble and fearless they were - one slip and they'd either be in the ocean or in a pool of huge groupers and red snappers. A friend supposed that they were working dogs, but I'm not exactly sure what help a dog can lend to a floating fish farm. That was the first kind of dog to dispel my anxiety - the happy and friendly kind. It turned out they were all too common in Vietnam. The other kind was the hot-and-tired doggo. 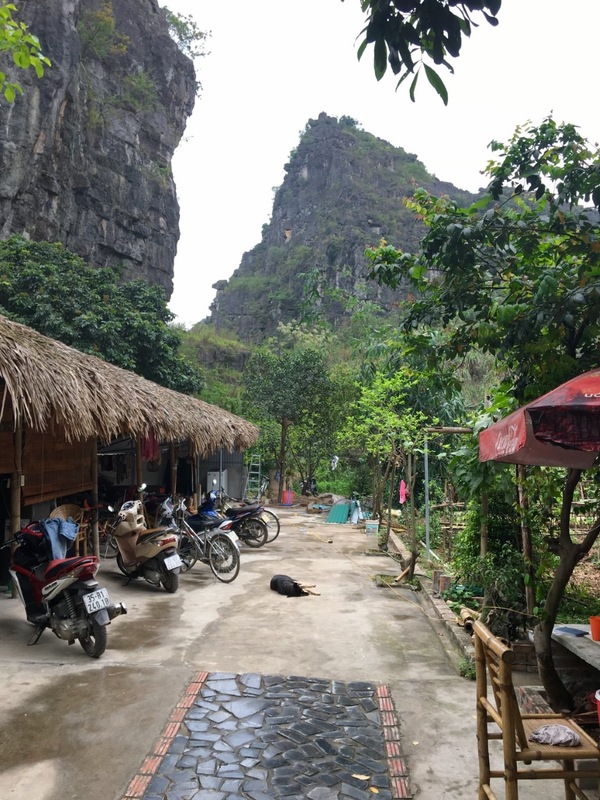 A bit further south of Hanoi, in the little town of Tam Coc, a dog would just lie in the middle of our hostel, all day every day (it wasn't dead). When I stepped out of my dorm each morning it was already in place, and when I got back in the evening it wouldn't appear to have moved at all. The heat and the humidity over there produces such lethargic behaviour in certain dogs that you rarely see back in England. Towards the end of my time in Vietnam I had reached the very end of Vietnam - an island called Phu Quoc, sitting south of the mainland. We paid a visit to one of the local pepper farms where we were given a tour by a lovely Vietnamese girl called Alice. 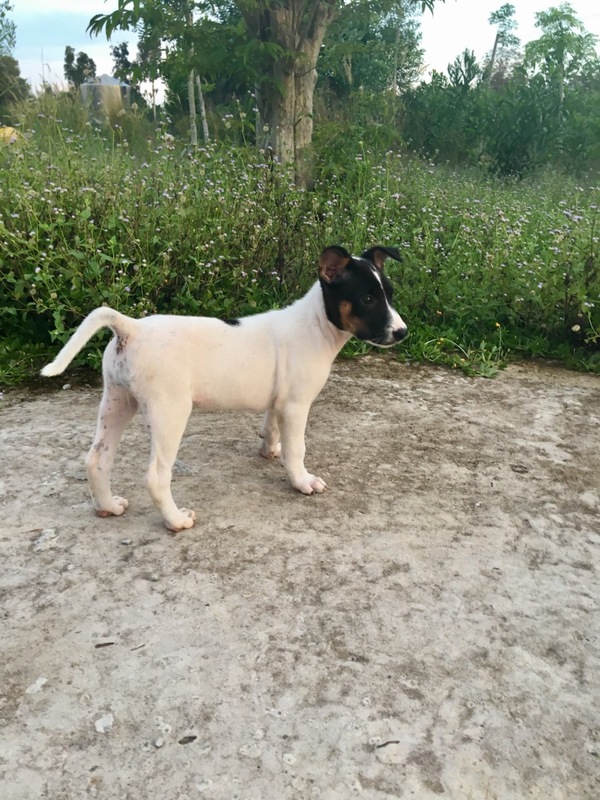 Not long after the tour had begun, a puppy appeared from nowhere and joined us for the walk. Alice said she had found him lost and abandoned in the surrounding jungle, so the puppy's name was 'lac', meaning 'get lost'. I was loving the puppy's company, watching it bumble around the plants and get distracted by the dragonflies, but Alice took it away shortly after. She explained that she was doing us a favour because 'he likes shoes'. I couldn't comprehend how nonplussed Alice was by the puppy while I struggled to concentrate on nothing else. I suppose if you become too familiar with dogs then you start to become apathetic. I miss a lot of things about Phu Quoc island, but nothing more than 'get lost'. 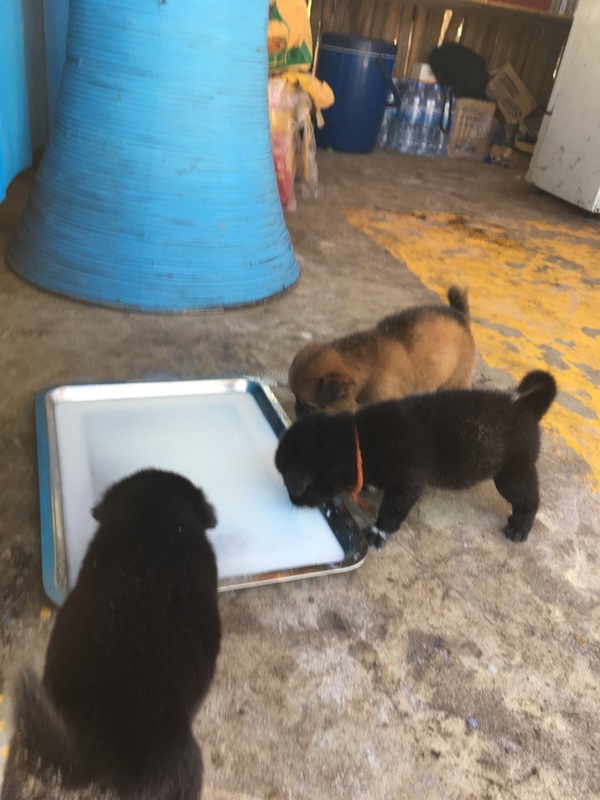 It was on yet another island that I discovered more puppies - this time six of them, each one about the size of a shoe. They lived on Koh Rong Sanloem, a small island south of Cambodia (about an hour's ferry-ride from Sihanoukville). This place had little wifi and no air-con. There were five black puppies and one brown one, living and playing in the sand all day and always being smothered by one or two delighted backpackers. If you lay on the sand near them, all six of them would surround your head and attack your hair. 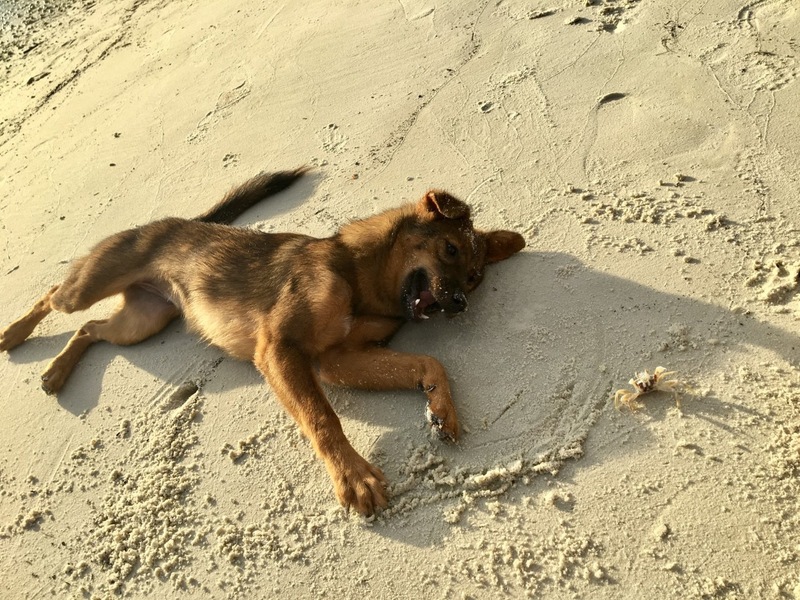 I spent many hours each day on Koh Rong Sanloem just playing with the puppies. It was funny watching the dogs attempt to run across the sand after their mother - the sand was so soft and powdery that they would inevitably fall face-first, standing up with a new mask of white. On the same island I also encountered the crab-catchers. Older mutts with beautiful golden fur that would chase crabs every morning. I woke up at 5:30AM for the sunrise, but I ended up taking more interest in what the dogs were doing. They ran across the beach silently - you wouldn't know about them until they had hurtled right past you. The dogs were sensible, using all their energy in the early hours before the day's intense heat began. I followed one dog for almost ten minutes, its attention entirely focused on the fleeing crab and not at all bothered about me. Again, I felt like my rabies vaccine was a redundant and expensive mistake. 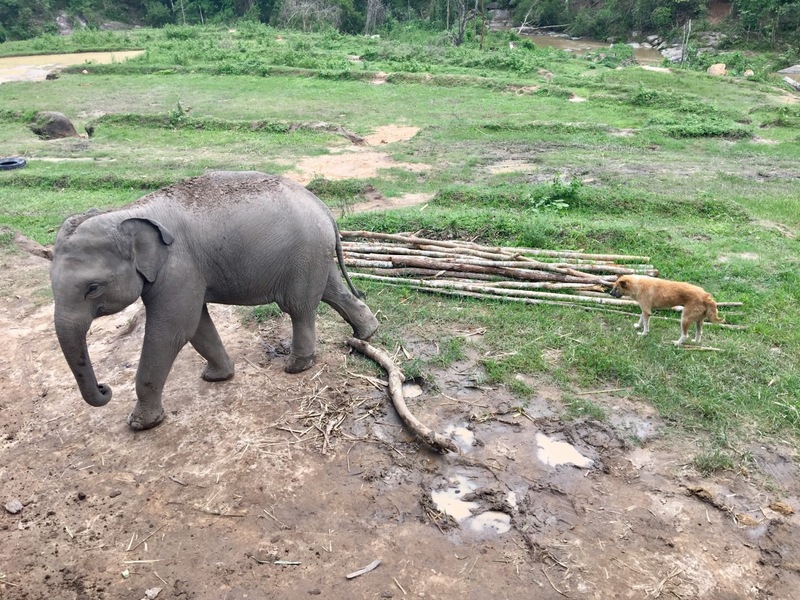 My final country, Thailand, presented me with a dog living in particularly interesting circumstances - an elephant sanctuary, near Chiang Mai. Most dogs get a lot of attention from visitors, but not when you live with four elephants. They all lived in a big, open valley together, but the dog went largely ignored throughout the day we were there - and I can assume that this is the same every day. He sat alone while we fed the elephants and walked with them. Even I found it difficult to tear myself away from the elephants and spend some time with the dog. The interactions between the two species were interesting - I couldn't tell which one was more unnerved by the other. When the dog got too close to an elephant, the elephant would huff and make a step towards it, causing the dog to run away again. It's tough, living in the shadow of elephants - although in the Thai heat it can have its advantages too. I've met more aggressive dogs since I've returned to England than I ever met in Southeast Asia. Black dogs in countryside farms that turn vicious when they see a stranger. There's no boiling sun here to sap all their energy. In hindsight, my rabies jab was pointless and I should never have been concerned about the dogs. Maybe the vaccine will prove more beneficial when I go to India. The Rhesus macaques of Jaipur are a different kettle of fish.